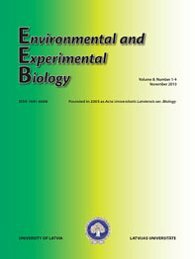 Environmental and Experimental Biology is an international print/electronic peer-reviewed scientific journal published four times a year, owned by a non-profit-making government-funded university. Founded in 2003 as Acta Universitatis Latviensis ser. Biology, since 2010 EEB. The EEB publishes original articles, brief communications and reviews. Original research papers covering all aspects of modern biology are welcome. Young scientists, especially PhD students in biology, biomedicine, environmental sciences, agricultural sciences, forestry, biotechnology etc., are encouraged to submit their contributions. The journal is oriented towards broader understanding of biological problems through study of interactions between different groups of organisms in heterogeneous environmental conditions as well as between organisms and the environment. Functional studies in different biological systems at all levels of organization, aimed to clarify unifying principles of genetical, biochemical, cellular, physiological and ecological mechanisms are within the scope of the EEB. Papers dealing with a regional context of biological aspects of environmental sciences, nature conservation and biological diversity could be considered as well. Manuscripts on interdisciplinary, complex studies, as well as those covering new or untraditional topics of biological sciences are welcome. The particular scientific problems analyzed could be related but are not limited to the fields of agrobiology, biomedicine, biochemistry, biogeography, biophysics, bioremediation, biotechnology, breeding, chemical ecology, environment protection, evolution, forestry, hydrobiology, marine biology, nature conservation, pathology, pharmacology, soil science, taxonomy, vegetation science. Manuscripts are usually peer reviewed by the Editor and two anonymous reviewers. Final acceptance or rejection rests with the Editor-in-Chief, who reserve the right to refuse any material for publication. Decisions on acceptance, revision, or rejection are made within 3 months of submission. Papers are usually published in chronological order of acceptance.